Requirements: If you want to wed legally in Tahiti you will need to start the process at least six months in advance (you can also marry stateside and enjoy ceremonial-only vows in Tahiti with far less paperwork). There are about six detailed documents that need to be translated and filed, including a Marriage of Foreign Citizens in French Polynesia document; a letter signed and dated by both spouses and addressed to the mayor of the commune where the wedding will take place; proof of identities (copies of both spouses passports); a certified copy of both spouses birth certificates issued less than six months prior to the wedding date, authenticated with an Apostile, translated into French by an approved translator and legalized by the French Consulate; a Certificate of Non-Marital Status signed by a lawyer, translated into French and legalized by the French Consulate; and proof of residency for both spouses (such as utility bills). 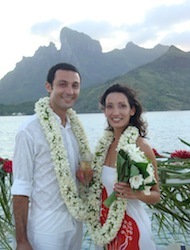 For complete details, visit Tahiti Tourismes dedicated weddings page (www.Tahiti-Tourisme.com/Weddings). Options: Without exception, the actual legal marriage will take place at the City Hall on the island where the couple will wed. 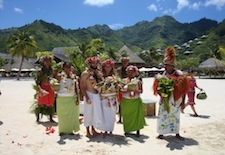 This can be immediately followed by a beach, chapel, or hilltop ceremony featuring any combination of traditional Tahitian vows (presided over by a priest in plumed headdress and ceremonial garb with both couples dressed in white pareus and adorned with crowns and garlands of flowers and then wrapped together in the vibrant Tifaifai or wedding quilt) or Western ceremony (presided over by a justice or minister with the couple in a wedding gown and suit). 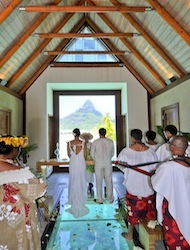 Depending on the locale, brides or grooms can arrive via dugout canoe, electric cart, or on foot to backdrops as varied as a glass-floored overwater chapel, a private motu (small island), or a catamaran sailing Bora Boras lagoon as the sun dips behind Mt. Otemanu. Moorea Pearl Resort (www.spmhotels.com/resort/moorea) This Tahitian-owned property offers colorful, flower-infused weddings in two wonderful locations: a convenient beachfront at the resort with the brides arrival by canoe to her awaiting groom (shown at left, about $800-$2,000 depending on extras such as musicians, dancers, and dinner), and a day-long celebration on a more private motu, reachable via a 20-minute boat ride (starting at about $2,000). All ceremony packages include musicians, floral leis and crowns, and traditional pareus for the bride and groom, plus a beautiful bed of flowers and Champagne in the couples bungalow. Rates from $271/night for a room and $430/night for a bungalow. InterContinental Moorea Resort & Spa (www.moorea.intercontinental.com) The jagged green peaks of Moorea create a stunning, altar-like backdrop (shown at right) as couples in white pareus and a coconut-shell top (for her) stand barefoot in soft white sand next to the brilliant pale blue lagoon and exchange vows at sunset in a vibrant and enjoyable music and dance-filled Polynesian ceremony. Here, the groom arrives by outrigger canoe and the resort offers the option of a Mini Ceremony (accompanied by 8-10 musicians and dancers for about $1,300) or a longer Grand Ceremony (15-20 musicians and dancers for about $2,000). The couple returns to their flower-decorated bungalow for canapés and Champagne, followed by a private or group dinner at extra cost. 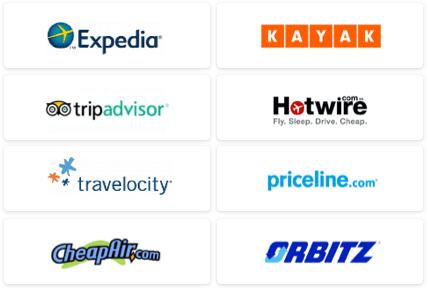 Rates from $287/night for a room and $427/night for a bungalow. InterContinental Bora Bora Resort & Thalasso Spa Lapped by Bora Boras legendary lagoon, with iconic Mt. Otemanu in direct view, this five-year-old luxury resort mixing distinctly contemporary décor with traditional Tahitian ambience is a truly memorable spot to exchange I Dos. In fact, there are several locations for weddings, ranging from an air-conditioned, glass-floored overwater chapel (from $2,050 and shown at left, courtesy of InterContinental Hotels & Resorts) to a sun-dappled beach (from $1,900)  both with mesmerizing Mt. Otemanu views. The resorts concierge/wedding planning team aims to personalize each marriage with the couples preferred mix of Polynesian and Western elements and post-ceremony cocktails and dining (tip: the fire dancers are a must!). Rates from $900/night (most accommodations are overwater bungalows, with a few two-bedroom family suites from $800/night). Four Seasons Resort Bora Bora (www.fourseasons.com/borabora) Couples can choose from seven wedding venues at this two-year-old five-star property  including a brand new catamaran, the Four Seasons Navigator, during a scenic two-hour sunset sail. After welcome Champagne and canapés, the couple and a maximum of 12-16 guests head up to the Navigators top deck for an intimate and breathtaking traditional Polynesian ceremony presided over by a Tahitian priest and accompanied by two musicians (from $2,150). As the lagoon shimmers and the passing scenery captivates, everyone revels in this very private and enchanting setting (shown at right). Other venues include the resorts beach, its tiny offshore Sunset Motu or its open-air wedding chapel. Afterward, dining and entertainment options range from a beach barbecue (again, reserve the fire dancer!) to a fine-dining gala for up to 100. 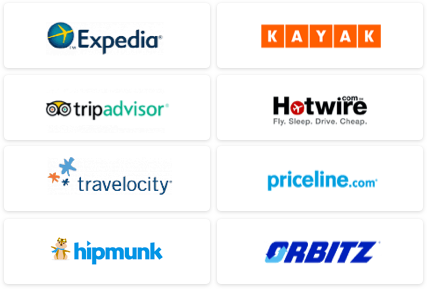 Rates from $900/night.